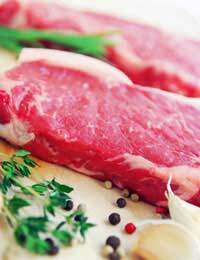 There are two ways of buying meat in bulk – purchasing a side of meat and either asking your butcher to cut it for you, or butchering it yourself, or buying bulk meat from supermarkets or other suppliers when they have the cuts you like at a reduced price. Freezer friendly packaging – supermarkets pack meat for ease of storage and transportation, but your butcher or you, working alone, will pack your meat so that you can store it easily in the freezer. How Much Meat Will a Freezer Hold? The rough rule is to assume that a cubic foot of freezer space will accommodate 35-40 pounds of butchered meat, if it is closely wrapped. Obviously if a lot of the meat is irregularly shaped, like lamb legs or pork shoulders it will take up more space. How Long Can Meat Be Stored? If you are packing beef into your freezer, you can expect to safely store joints and steaks for up to a year and mince for three months. Pork joints can be stored for eight months, chops for four months and bacon for a month. Lamb joints can be stored for up to nine months, chops for up to four months and minced lamb for up to three months. Cooked meats have a different freezer life – soups containing meat can be stored for up to three months, meat pies and sausages for two months. Prepare, wrap and freeze meat as soon as you can. Every day that you keep meat unfrozen will lower its quality. Make sure you freeze the meat in portions for one meal, so that you don’t have wastage. Put greaseproof paper between chops and steaks so that they can be pulled apart while frozen to thaw quicker. And ensure you label your meats clearly so you don’t forget what is in each package. When you’re comparing the cost of a bulk purchase with buying meat in smaller quantities from a butcher or supermarket, remember to factor in the extra costs, such as the time it takes you to cut the meat, the wrapping materials, and the cost of running the freezer.